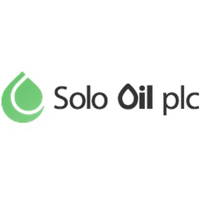 Solo Oil plc (LON:SOLO) is pleased to note the announcement made today by UK Oil & Gas Investments PLC – “Portland Extended Flow Test: Well Clean-Up Phase Complete, Dry Oil Flows to Surface, Horse Hill-1 Oil Discovery, PEDL137, Weald Basin, UK” and set out in Appendix 1 below. The Company holds a 9.75% beneficial interest in licence PEDL137 containing the HH-1 oil discovery. · Metered daily oil rates to date equal to or exceed 2016 values. Highest observed hourly rate equivalent to an implied daily rate of 352 barrels of oil per day (“bopd”). Corresponding metered solution gas volumes are up to an implied rate of 30,000 cu ft per day. UK Oil & Gas Investments PLC (LON:UKOG) is pleased to announce that it has been informed by Horse Hill Developments Ltd, the operator of the Horse Hill-1 Kimmeridge and Portland oil discovery, in which UKOG holds a 32.435% beneficial interest along with licence PEDL137, that the initial well “clean-up” phase of the Portland extended well test programme has been completed according to plan. Over the past four days, the well has delivered a sustained dry oil and solution gas flow to surface via pump and natural flow. Observed metered Portland flow rates to date are broadly equivalent to, or exceed, those recorded during the short duration 2016 test. The highest recorded hourly metered rate to date, equates to an implied daily rate of 352 bopd and was achieved using a 20/64″ choke, a notably more restricted setting than the 64/64″ choke used in 2016. Corresponding solution gas flows have been measured up to an implied rate of 30,000 cubic feet per day. Note that, to date, flow has not yet been optimised for maximum sustainable production rates, this will follow in the subsequent test sequences. Several periods of sustained natural flow (i.e. flow to surface without pumping) have also been observed over the past few days, with the most productive period producing an implied daily dry oil rate of 228 bopd over a two-hour period. Initial reservoir parameter analysis indicates that the Portland is performing very well compared to the productivity measured in 2016 prior to temporarily shutting in and suspending the well. To date a total of 463 barrels of light sweet 36 API crude have been recovered to surface during the clean-up period, together with all 141 barrels of completion and kill fluids (i.e. saline water) used to suspend the well after the 2016 well test. The well will now be shut in for a planned 24-hour pressure build-up test. Operations will then include further flow parameter optimisation, followed by the first of three planned flow sequences designed to assess whether the Portland oil pool contains a commercially viable volume of oil. The first test sequence will likely include an optimised maximum rate test, prior to choking back the well to provide the steady state flow conditions necessary to determine the Portland oil pool’s connected oil volume. Note that in order to collect the required data during these steady state flow periods, rates will likely be below any future optimised production rates. Testing of each of the Kimmeridge Limestone 4 (“KL4”) and KL3 oil pools will follow completion of the Portland test sequence. “Test results to date have exceeded our initial expectations given the length of time the well was shut-in since 2016. Although we are in the very early stages of our 150-day test campaign at Horse Hill, the signs to date are extremely positive for the Portland oil pool. The unexpected bonus of natural oil flow to the surface, without the use of a pump, gives us cause for further optimism regarding the Portland’s overall commercial potential. It is important at this stage, however, to keep our expectations at a realistic level. As the 2016 short flow test campaign established commercially viable initial flow rates for each of the Portland, KL4 and KL3 zones, the 2018 EWT’s prime goal is to confirm that the wellbore is connected to a commercially viable oil volume within one or more of the three zones. The long-term reservoir performance data is also expected to provide the necessary data to enable, for the first time, Petroleum Resources Management System compliant Kimmeridge and Portland reserve figures to be estimated at Horse Hill. Each test sequence will include a short, optimised rate test, together with a sequence of “choked back” (i.e. reduced) steady-state flow periods necessary to obtain the data required to determine the connected oil volume within each zone. A series of associated long pressure build up tests are also planned. Oil produced from the EWT will be sold on the “spot” oil market and any revenues will be utilised to offset overall testing costs.